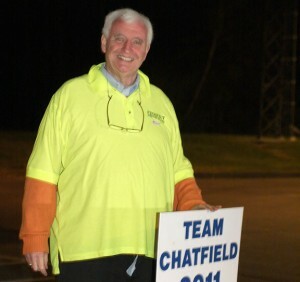 Town Council Chair Tom Galvin stumps for the Republican Party outside the Fire House in Prospect Tuesday night. Galvin and his fellow Republicans maintained their majority on the Town Council. PROSPECT — Republicans maintained their five-to-four majority control of the Prospect Town Council on Tuesday night, as all nine incumbent council members retained their positions. “If it ain’t broke, don’t fix it,” said Republican Town Committee Chair Thomas Galvin, echoing the oft-heard motto of Mayor Robert Chatfield. A sentiment the majority of Prospect citizens agreed with. Galvin, who held his seat on the council, believes the Republicans maintained their majority because of a consistent record of doing what is best for Prospect. Forty-four percent of voters turned out to cast their ballot with most Republicans winning by a two-to-one margin. Ten candidates were vying for a seat on the nine- member council. The candidate who did not receive a seat was the only one who did not hold one previously— Eileen Cranney, a Democrat and native of Prospect. Democrat Michael Scaviola narrowly edged out Cranney by five votes to retain his seat. While disappointed to have not taken the majority, Democratic Town Council member Patricia Geary believes this is a moment for Democrats to collect themselves and reflect. In other races, Democrat Peter Blinstrubas and Republicans Lisa E. Mason and Marie J. Kluge won seats on the Board of Assessment Appeals all earning more votes than Democrat Janice Mallon. Democrats E. Gil Graveline Jr. and Gregory Ploski along with Republican Jack L. Crumb won seats on the Planning and Zoning Commission all earning more votes than Unaffiliated candidate Tim Reilly. Republicans David Wartko and Donna Cullen won open seats for a four-year term on the Region 16 Board of Education over Democrats Jeffrey LaMontagne and Chip Aldrich. Republican Nazih Noujaim defeated Democrat Trish Spofford for a two-year term on the board. Republicans Charles Wilkowski and Marianne Byrnes along with Democrat David Michaud won seats on the Zoning Board of Appeals all garnering more votes that Democrat Gena Mann. M. Carrie Anderson was reelected as town clerk, David Young was reelected as town treasurer, and Diane Lauber was reelected as tax collector. All three are Republicans and were unopposed.